You can’t write about Indonesia without allocating a chapter to its huge cultural and artistic heritage. This immense archipelago possesses a large repertory of traditional dances specific to each area. Who wouldn’t marvel at the sight of the magnificent Javanese dancers reviving Indian sagas at the Royal Palaces? 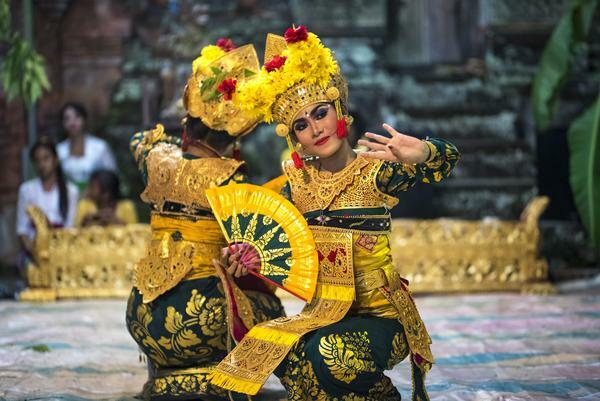 How not to be seduced by the elegance of dramatic dances performed in many Balinese villages? Let yourself be swept along in the islands’ extraordinary assortment of modern and classic dances. Being home to innumerable cultural and religious manifestations with over seven hundred ethnicities, it would be biased to designate one particular dance to represent the entire nation. Therefore, the Indonesian dances presented internationally are often a mixture of different components taken from several dances. There are nevertheless two dances considered as national: the dangdut and the poco-poco, pronounced pocho-pocho. Born at the beginning of the 20th century, they mark the appearance of modernity and rhythmic pop music in the country. Dangdut music popularized in the 1960’s is largely inspired by Indian films and music. Poco-poco is a line dance originated from the Celebes (Sulawesi). Men, women and even children perform the same steps, all together in lines, accompanied by hips and arm gestures. Although they don’t figure on the traditional repertory, these two dances constitute important cultural aspects on the national level. The circumstances leading to traditional dance performances may differ from one region to another as they are often associated with rites, religious ceremonies or monarchical protocols. In South Sulawesi, visitors are greeted by a welcoming dance called pakarena, performed by young women playing with a traditional fan. In North Sulawesi, men dance the kabasaran, a war choreography that used to be executed before combat. Nowadays, the dancers wearing magnificent headdresses, red costumes, swords and spears perform in front of visitors. In that part of the island, European influence deeply imprinted the traditional heritage, especially the dances. For example, people dance the katrili imported by the Spanish colonisers. 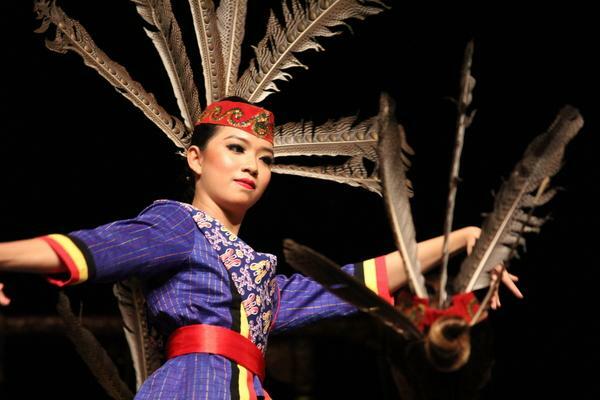 Dayak and Malay groups of Kalimantan (Borneo) also own various dances in accordance with their customs. In Aceh, the northern tip of Sumatra, men perform the saman. Sitting on their heels, they play body percussion with their hands while singing rhythmic verses. This dance has been classified by UNESCO as an Intangible Cultural Heritage in Need of Urgent Safeguarding. On another part of Sumatra island, in the region of Palembang, nine girl dancers dressed in sumptuous colourful costumes with gold thread salute the travellers with gending sriwijaya. Javanese and Balinese people used to have similar dances. Through history they’ve developed differently with Java abandoning Hinduism to embrace Islam. Most traditional dances originate from the two famous Indian epics: Ramayana and Mahabharata. Playing gods and heroes, the dancers enact the stories from the great Hinduist mythology. In Java, royal dances flourished in the monarchical era of Mataram. Numerous dance schools emerged especially in the two kingdoms of Yogyakarta and Surakarta. Among many royal court dances still performed to this day the most renowned are: bedoyo ketawang and srimpi. The bedoyo ketawang depicts the legendary meeting of Ratu Kidul, the Queen of the Southern Sea, with the king of Mataram, Panembahan Senopati. This sacred dance is performed by nine girls, formerly from royal descent. The srimpi dance is executed by four girls representing the four elements: water, fire, earth and air. During the same period, wayang wong, the danced theater reached its apogee. In Bali, Legong kraton is the traditional court dance. It is executed by three young girls depicting divine maidens. The condong, meaning servant, presents a solo prelude. Later, the two Legong, royal descendants wearing identical costumes and moving synchronically, follow her on the stage. 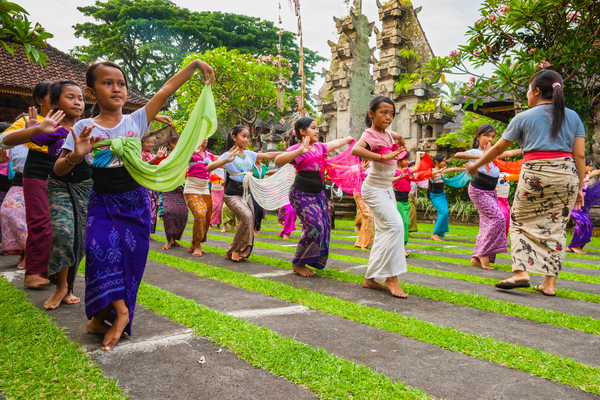 Excellent legong dances are frequently performed around Bali. In former times, the nobles and royalty alone had access to court dance lessons and performances. Since then, numerous dances have been transmitted thanks to a democratisation of techniques and practices implanted in villages. In today’s Indonesia, performing art schools are established in every big city. Tourism contributes largely to rehabilitate and promote these art forms by creating a constant demand for shows and performances. Many Indonesian contemporary artists devote their life to perpetuate and promote the traditions. If you’re planning to visit Java during the dry season, don’t miss the Ramayana ballet performance in Prambanan, just at the foot of the temples. You’ll be impressed by the quality of the staging. The elegant dancers are often among the best in the country! Enjoy every chance you have to view dances and ceremonies anywhere in the archipelago. They’re frequent, often impromptu and always fascinating! Azimuth Adventure Travel Ltd is Indonesian travel agency, created in 1999. Specialists in adventure travel and volcano ascents in Indonesia, we have expanded our offer to allow all nature lovers and Indonesian culture to get off the beaten path and discover an authentic and multicultural Indonesia. In freedom, in stay in measure or within a small group of travellers, come to explore and live with us Indonesia passionately! I am Alice from "Azimuth Adventure Travel". Leave your message.